The Four Nine Design team believes strongly in supporting the local community. We have started an on going Art Cares project which will include multiple installments of limited edition posters. Each installment will focus on a different theme and proceeds will go to a local nonprofit organization. Four Nine Design announces its Celebrate Diversity Campaign, the first installment of it’s ongoing Art Cares Project. 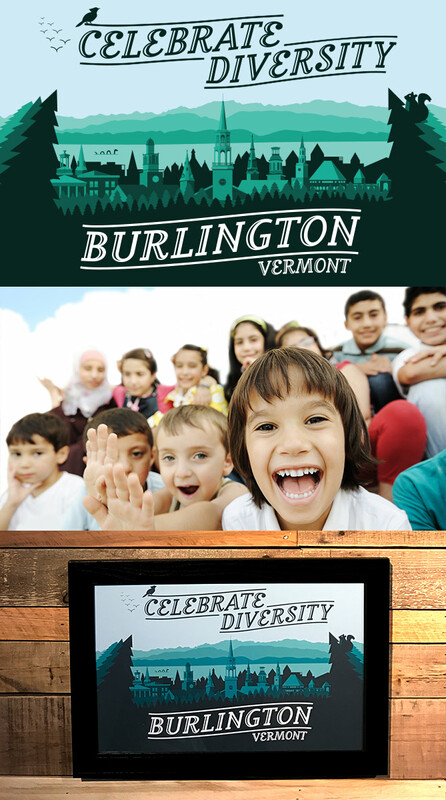 Burlington prides itself on being a place that fosters cultural diversity, social cohesion, and multiculturalism and Four Nine Design invites you to take part in this celebration. All proceeds will go to Burlington Vermont’s own King Street Center. “The atmosphere has changed. We wanted to produce and spread a positive message that would be appreciated by everyone”, said Julius Higgins, Partner and Web Director at Four Nine Design. “Our hope is that this is a reminder to be patient, accepting, and enjoy our beautiful city”. Anyone can be a part of the campaign by purchasing a limited edition, framed Celebrate Diversity poster for $100. In choosing to support the campaign, businesses will be featured on a post on Four Nine Designs social media pages. Take Part in the Campaign! Get your poster today! Purchase your limited edition, framed and numbered Celebrate Diversity poster for $100 plus shipping. In choosing to support the campaign, businesses will be featured in a post on Four Nine Design's social media pages.